Getting to know the MashMeTV Team(II) – Alicia Díez | MashMeTV, the blog! Well, my trajectory is really short, I am still wet behind the ears… there’s so much for me to learn out there! I found out my passion for programming in my first year in University. I’m sure my professor helped, he turned out every code in an enjoyable conversation between you and the machine. Since then, I have chosen every single programming subject I could. I also took part in the same investigation group as Eduardo and there I met Víctor. When Víctor told me about this project and asked me to join, I almost couldn’t believe my luck. I had the chance to work in a start-up, see how everything takes form from the very beginning and feel a part of it. This is something you can’t find in a regular job. Besides, the working situation in Spain is far from brilliant right now. But this isn’t the only reason. I got to know Víctor and Eduardo enough to know that we could be the perfect team and have fun while doing so. Most of all, my mission is to make users’ lives as simple and easy as possible. MashMeTV has a great variety of features, but we are fully conscious that if our user cannot understand them it won’t matter at all. So what basically I do in MashMeTV? I hit my partners every time I see something that sets off my “user experience” alarms. A great remedy for stress, really. Jokes apart, I also code and test every functionality, just like everybody else in our office. In two years… I see it as a rival on a par with the stronger of our competitors, the “He-Who-Must-Not-Be-Named” of MashMeTV, so I’ll whisper its name… ready? Skype. It’s a really difficult task, but be sure that we will do our best. I am a very normal –geek- person. I love reading, playing computer games, watching films or series… I hate spoilers with all my heart, so I won’t tell which ones to avoid temptations. Of course, I wouldn’t live without my friends. That is a really hard question… every person is a whole world and I’m sure each of our users comes to MashMe searching for different things… but here I go: if you find yourself far away from the people you care, MashMeTV is your tool to share things while watching their faces and reaction. 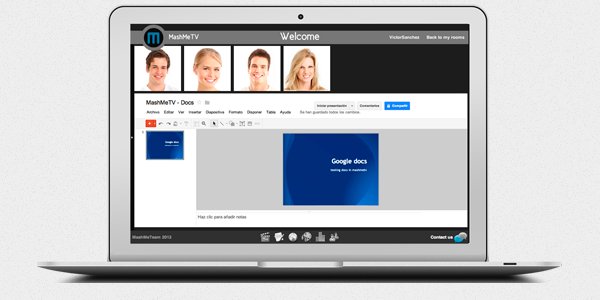 If you are far from the people you work with, MashMeTV is your tool to give clear explanations and instructions with no trips. Anyway, MashMeTV is your tool! What do you think about Alicia? =) Comment below!